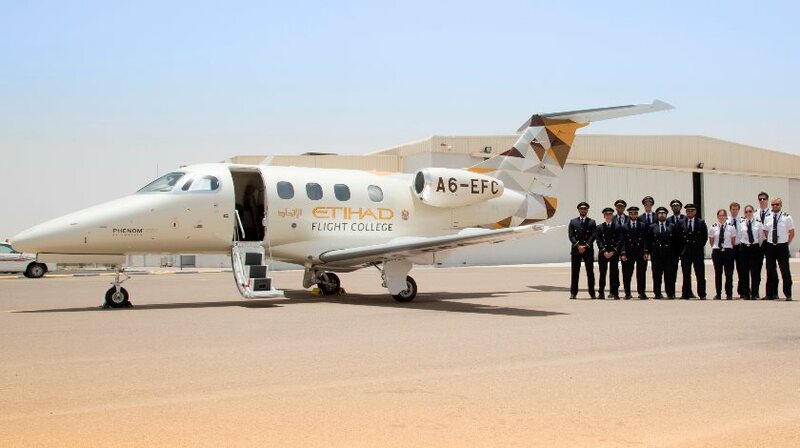 Embraer Executive Jets has delivered the first Phenom 100E to Etihad Flight College, a wholly-owned subsidiary of Etihad Airways, the national airline of the United Arab Emirates. The aircraft arrived yesterday in the city of Al Ain, base of the flight school established to train ab-initio pilots for the airline’s rapidly expanding fleet. Embraer and Etihad Flight College announced a contract for four Embraer Phenom 100E in June 2015. A second Phenom 100E is scheduled to arrive at the flight college’s base later this month. Two additional jets will be delivered in early 2017. Embraer currently has over 20 Phenom 100E orders for flight training proposes, including options. Recently, the aircraft was also selected to provide multi-engine pilot training to armed forces aircrew — Royal Air Force, Royal Navy and British Army — in the United Kingdom. The contract with Affinity Flight Training Services (AFTS) will provide five aircraft to the U.K Ministry of Defence’s Military Flying Training System, (UKMFTS) program. The Phenom 100E, Embraer’s first clean-sheet design light jet, which revolutionized the entry-level market, is also used by flight schools in the US, Finland and Australia for pilot training and instruction. A fleet of over 330 Phenom 100s is in operation worldwide.